Readers should note that this is a “Beta Version” estimate of the Type 054A’s production costs. It is well-developed, but will almost certainly evolve as more participants contribute their insights. I share my core calculations and assumptions in order to provide a springboard for other analysts and hopefully catalyze a broader discussion that advances our knowledge of China’s naval-industrial complex. This author estimates that the Type 054A currently costs a total of approximately $348 million per vessel to build and fit out (Exhibit 1). 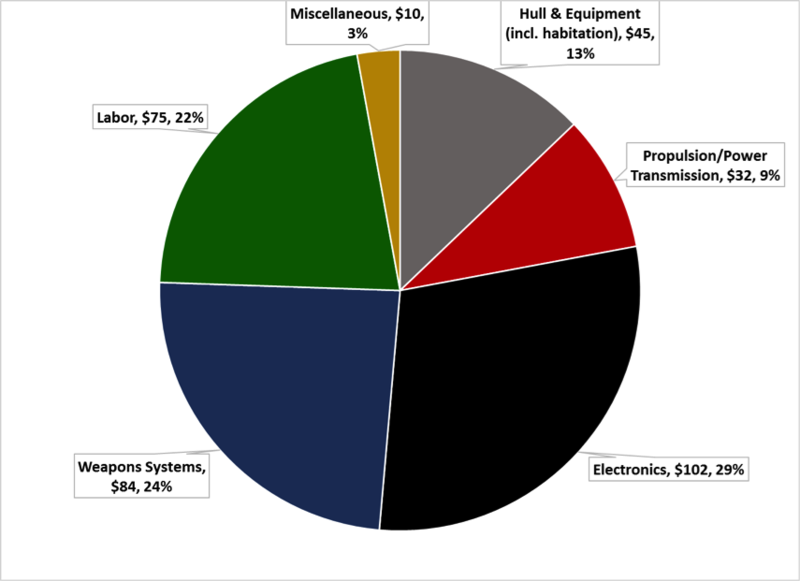 This estimate derives from breaking the ship down by its main systems categories (hull and equipment, propulsion/power transmission, weapons, and electronics) and calculating their respective costs, as well as the cost of the labor needed to assemble the ship into a finished product. The estimate relies heavily on valuation by analogy in many cases because Chinese sources simply do not disclose cost information on the vast majority of the inputs used in warships being built in China. As such, the figure as stands is conservative and may overestimate the construction and equipment costs.